His personal journey of raising a child with cerebral palsy gave him deep insights about the unequal world we were living in. BENGALURU : Hosting India Inclusion Summit for the seventh year in the city, India Inclusion Foundation will bring together thought leaders from various fields to provide insights on inclusion. The aim is to inspire at least 10 million people by 2020 and make India inclusive by 2030. In a conversation with City Express, V R Ferose, the founder and managing trustee of Indian Inclusion Foundation, talks about the inspiration behind India Inclusion Summit (IIS). He says, “It started in January 2012 over an informal lunch conversation with Dr Arun Shourie (former cabinet minister, Journalist and Magsaysay Awardee), who sore the seeds of the idea to get like-minded people to come together and drive awareness about people with disabilities. 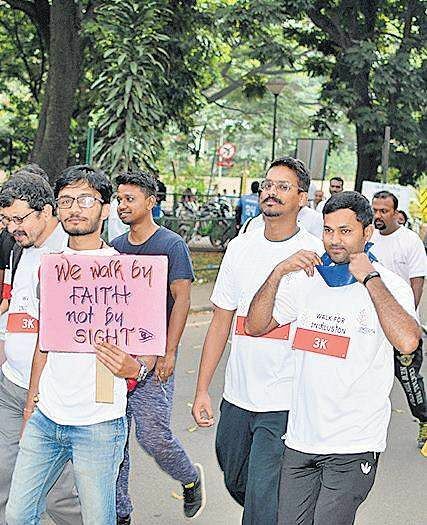 As part of the Indian Inclusion Summit this year, an inclusive walkathon was organised for the first time in the city on October 14. Over 2,000 people registered for the event. It saw the participation of all age groups and people with disability. The aim of the walkathon was to create awareness and spread the idea of inclusion across India and the world. The India Inclusion Summit will be held at Raddison Blu, Marathahalli on November 18. You can register the event for free on their website indiainclusionsummit.com.